Welcome to your open thread, Kotaku! And happy Friday the 13th! 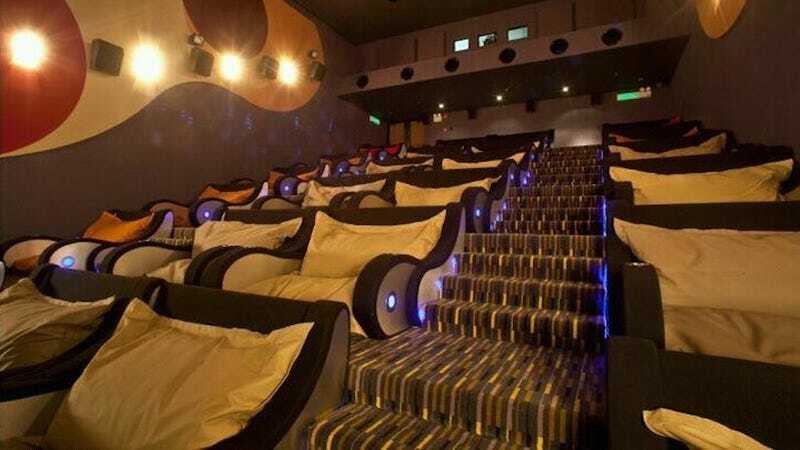 Since not everyone seemed to appreciate the Titanic movie-going experience I posted the last time I did open thread, I have a new movie theater suggestion for those looking more for comfort than experience. This Image Has Spoiled Me. I Now Refuse To Watch Movies In Any Other Way. Hey Kotaku! Kirk is out today, so in his absence I shall steer this conversation. You'll just have to go all the way to Malaysia for it. Although Reddit found this picture for me, there are actually plenty more local comfy theater selections. I went to the Gold Class Cinemas theater in Austin, for instance, but while the blankets, pillows, and reclining chairs were awesome, the pretentious feel to the "luxury" cinemas was not so much. Also I fell asleep. So there's that. Anyway, onward to linky goodness! Cookie-flavored wallpaper. - I think my cat would enjoy this. The periodic table can actually be a form of art, too. - Fun designs. For science! A barrel organ made out of LEGO plays the Star Wars theme song. - There's a whole lot of weird awesome going on in here. Learn how to build a world-record paper airplane. - My parents are architects, so we always cheated and used other materials with the paper. Baboons can distinguish real English words from strings of letters. - This is insanely cool. Hamster comes back to life. - One second the hamster is dead, the other he's running around like being buried two feet under was a routine afternoon activity. That's all for tonight! Hope you enjoyed the links, conversation, and start of the weekend.